Yesterday I commented on the fact that the Millets store at MetroCentre was having a closing down sale; today, I noticed that the branch in Newcastle’s Grainger Street (above) is also evidently among the 89 Blacks Leisure Group stores that are being shut. However, Hexham’s store – which I visited (and photographed) on Saturday – looks to be safe. 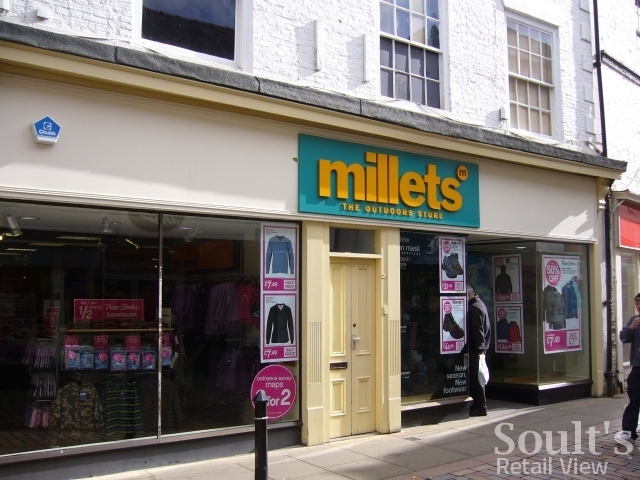 In some ways the news that Newcastle’s Millets is to close is not surprising, given that Newcastle city centre is one of those locations – like MetroCentre – where Blacks and Millets currently compete with one another. On the other hand, though, it seems rather a waste of a store that only opened a year ago. Prior to housing Millets, the unit at 81-83 Grainger Street was occupied by Blacks; when Blacks shifted to Eldon Square and the former O’Neill site late in 2008, Millets moved down the street from its former site at numbers 121-127. As I noted last week, the former Millets store remains empty, meaning that Grainger Street will have the unusual feature of two empty Millets stores within a few doors of each other. 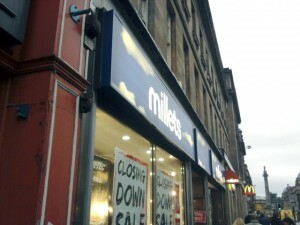 Given that last week’s official announcement about the store closure programme spoke of an “employee consultation process on 89 loss making stores”, the speed with which closing down sales have been launched is surprising – it suggests that the closure of the stores concerned is a fait accompli, rather than being open to review. Equally, it seems like this is just the first step in getting Blacks Leisure Group back onto a firm financial footing; industry speculation suggests that Blacks may yet seek to enter a company voluntary arrangement (CVA) with its creditors, in order to secure its longer-term future. Whatever happens next, it’s a sad and uncertain time for yet another longstanding high street name, and most of all for those hundreds of shopfloor staff who are likely to lose their jobs. One can only hope that the steps being taken now will be enough to protect the 300 or so stores that remain. After all, with holidays at home never more popular than now, Blacks – as probably the UK’s best-known outdoor retailer – has no excuse not to do well, if only it can position itself, Mothercare-style, as a real authority within its field.